Lock in a great price for B&B Hotel Donostia Aeropuerto – rated 8.5 by recent guests! Nice, modern room in white colours. Nice bathroom with 2 showers, that's a first for me. A selection of English-speaking TV channels. Decent breakfast. Clean. Bus stop in front and Carrefour next door. Decent breakfast buffet but expensive at 10Euros per person. Very nice spacious modern rooms, friendly stuff, comfortable bed, free parking, free coffee and tea facilities in lobby. Great deal for this price. Right on the bus line between Hondorriba and St. Sebastian. Free Coffee drinks. Attached to a Burger King that opens about noon. Huge comfortable bed, simple clean-lined decor, modern bathroom, easy free parking. Staff is friendly and helpful. Nice lobby lounge area with bar. Buffet restaurant next door is very convenient. Free coffee even though we chose not to pay for the buffet breakfast. Free parking near the hotel, clean room, nice beds, good wifi. This is the best travel hotel that we have stayed in whilst journeying to Southern Spain from UK, over the last 14 years. I couldn’t fault the staff the property or the room for any reason. B&B Hotel Donostia Aeropuerto This rating is a reflection of how the property compares to the industry standard when it comes to price, facilities and services available. It's based on a self-evaluation by the property. Use this rating to help choose your stay! 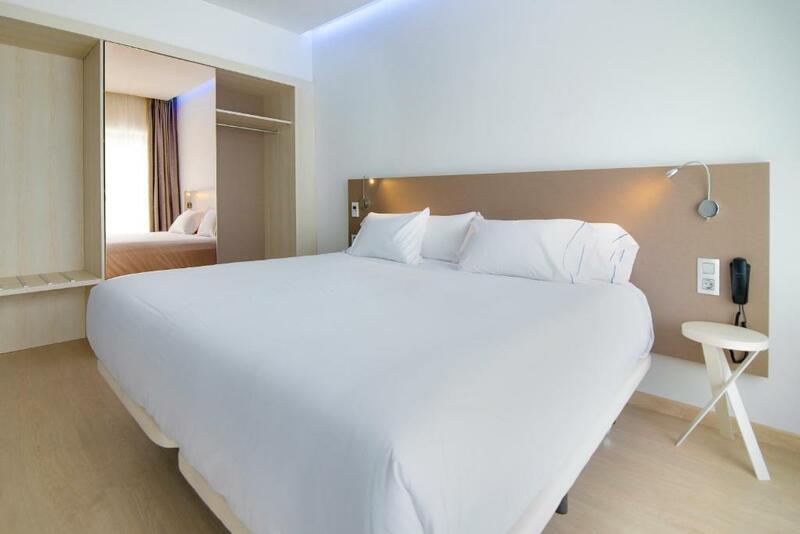 One of our top picks in Oiartzun.Located in Oiartzun, 15 minutes’ drive from San Sebastián Airport and from the center of both Irún and Hondarribia, B&B Hotel Donostia Aeropuerto offers stylish, air-conditioned rooms and free high-speed WiFi. The bright rooms come with air conditioning, a 40-inch flat-screen LED TV, a large desk and a private bathroom. Guests will find a tea and coffee service in the lobby 24 hours a day. B&B Hotel Donostia Aeropuerto also offers a 24-hour reception, meeting rooms and private parking is available on site at an extra charge. Central San Sebastián and La Concha Beach can be reached in 20 minutes’ drive. Guests can visit San Marco Fortress and Jaizkibel Mountain, also a 20-minute drive away. From the hotel there is easy access to the AP-1 Motorway, which connects with Burgos and Madrid. This property is also rated for the best value in Oiartzun! Guests are getting more for their money when compared to other properties in this city. When would you like to stay at B&B Hotel Donostia Aeropuerto? This stylish, modern room has an extra large double bed and includes free WiFi, air conditioning, a 40-inches flat-screen TV, a safe and a private bathroom with a bath or shower. This stylish, modern room has an extra large double bed and includes free WiFi, air conditioning, a 40-inch flat-screen LED TV, a safe and a large bathroom with a bath or shower. This modern, air-conditioned room comes with a king size double bed and a sofa bed up to 1 children. There are 2 40-inch flat-screen LED TV, a safe and a private bathroom with shower. This stylish, modern room has 2 large single beds and includes free WiFi, air conditioning, a 40-inch flat-screen LED TV, a safe and a large bathroom with a bath or shower. This stylish, modern room has 1 large double bed and 1 large single bed. It includes free WiFi, air conditioning, a flat-screen TV, a safe and a bathroom with a large double shower. This modern, air-conditioned room comes with a king size double bed and a sofa bed. There are 2 40-inch flat-screen LED TV, a safe and a private bathroom with shower. This modern, air-conditioned room comes with a extra large double bed and a sofa bed up to 2 children. There are 2 40-inch flat-screen LED TV, a safe and a private bathroom with shower. Please note that after 15:00 the accommodations cannot set up the sofa bed. Please contact them beforehand. House Rules B&B Hotel Donostia Aeropuerto takes special requests – add in the next step! B&amp;B Hotel Donostia Aeropuerto accepts these cards and reserves the right to temporarily hold an amount prior to arrival. B&B Hotel Donostia Aeropuerto accepts these cards and reserves the right to temporarily hold an amount prior to arrival. Please note that only service dogs are allowed at the property. Please note that the reservation must be paid upon arrival. Please note that private parking on site is subject to availability at an extra charge. Please note that no extra beds are available in this property. Nothing other than a busy road outside as most of these place are. last time we were there we were offered a discount card for the restaurant next to it but this time we asked about the restaurant and opening times but were not offered the discount. the bed was great, good parking, easy check out. Spacious, modern and clean. Very friendly and helpful staff. Buy something for breakfast, because the one you pay for is extremely meager. There are NO services in the area. Would have preferred firmer pillows. Because of our tight itinerary we forgot to mention to staff at reception that there was a slight leak from the corner of the shower in room 125. Managed to mop the water with towels. Ideal location for a family wedding nearby. Clean and spacious rooms with good ensuite facilities. Friendly and helpful staff on reception and more than willing to arrange a taxi for us. Plenty of choice of continental breakfast. Not enough car park spaces, had to park at nearby company car park. Restaurant around is a buffe or fast-food only.